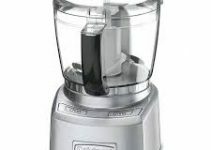 Cuisinart has a winner in the market with extremely affordable mini food processor in the market. DLC-1SS comes in brushed stainless and white. With the addition of less than $10, you can get a stainless finish which is still a win-win situation with the result this guy is able to offer. It’s a small size machine so if you are single or have a small family along with a pet this guy can lower your burden. The body is made up of plastic and its small size and lightweight will enable you to place it in the cabinet and take it out on your counter. The blades are made up of metal and are very sharp. You have to be careful while taking it out of the bowl. Make sure you do extra care you as you might get a cut on fingers. The blades are tough and are able to go into different speed mode and a big plus point that is they are also reversible. At 8 inch tall and few inches wide its designed after careful engineering and attractive build. It has a small powerful motor which justifies its size. The two-speed buttons of LO and HI are there to control the mix from coarse to fine. Initially, you will get very mushed output but with some usage, you will learn how to get the slightly bigger mix at the end. Do not fill it to its full capacity as that might overload the motor. The best part is it is dishwasher compatible and with an added spatula, you can take of the food build up from the corner and wash it with your hands if the dishwasher is not available. It is not as quiet as its big brothers but still, it won’t harm much as it is small and will not take much space on your kitchen counter and with a stainless finish, it can add the more professional look to your culinary. You can grate cheese, chop herbs, make pesto or small batches of salsa. 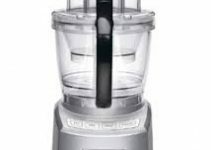 Grinding nuts and making nut butter in addition to nice creamy hummus is possible with this Cuisinart mini food processor. Parsley for Tabbouleh or turkey burgers it’s all possible for this. For grinding coffee bean the blade has to go all the way down to make a very fine result. The blade doesn’t go all the way down for excellent results but still, you can make good coffee with it. Common items like onion, garlic, peppers are not a problem for this mini chopper. With a capacity of 21 ounces it can handle 3 cups but for long-term usage and low burden on the motor, a 2 cup load would be fine. For a big family dinner just cut down the pieces into half-inch pieces and place inside the bowl. Its will be durable as its big brothers but in order to keep the motor running, you have to follow some precautions so the machine remains in working condition. No Pulse button just HI and LO speed. It is recommended that you stick to 7 to 8 seconds of pushing the on button down. Going further than this might be harmful to the motor. If you wish to keep this machine in your kitchen for years to come it would be a good decision to stick to maximum 10-second policy. You would have to do multiple batches to get the mix for a family reunion. To check current price please click here. Overall the product has an extremely good rating and it’s expected to be continued in terms of support from Cuisinart. 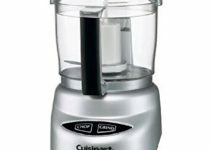 Cuisinart mini food processors have already made good marks in the market and this product is among the leading members in making a good name for the brand. So don’t wait for more if you are on a budget and looking for good result buy a unit now!